It’s May 1920 in a Dublin tenement. The Irish War of Independence rages outside. But in this cluttered room, there’s a poet who may be a gunman. That’s Donal Davoren (James Russell), who shares the room with Seamus Shields (Michael Mellamphy), a traveling salesman of braces, laces, thread, spoons, forks, bits and bobs. Their relationship and their visits from neighbors play out against the backdrop of the guerrilla war against British rule. 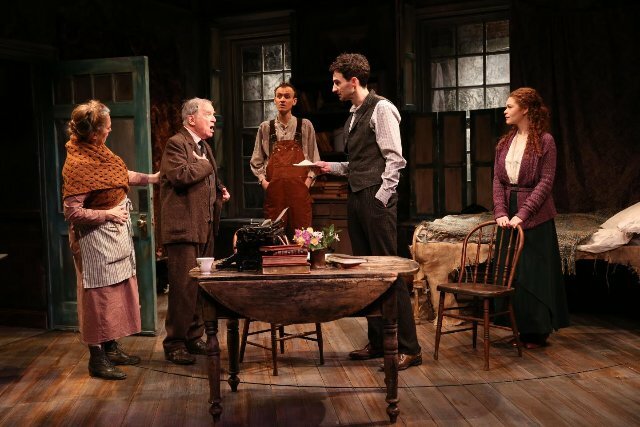 Sean O’Casey’s play, The Shadow of a Gunman, now on stage at Irish Repertory Theatre, tricks us into thinking this might be a comedy about drunken and verbose Irishmen. It all takes place in one room, where a few comic or even buffoonish characters visit and dominate act one, before the play descends into reality. Director Ciaran O’Reilly, Irish Rep’s co-founder, threads these pieces together to create a faithful reproduction of O’Casey’s work, not a reinvention. Mr. Maguire (Rory Duffy), known as a soldier of the IRA, stops in to see Seamus but quickly departs, leaving a sturdy black valise behind; he’ll retrieve it this evening, he says. And of course, Maguire’s valise turns out to be Chekhov’s gun. When the Tans begin knocking on doors, Minnie bravely takes it to her room, saying, “They won’t harm a girl.” When Minnie is taken away by the Tans, both Seamus and Donal worry about whether she’ll betray them, not about whether she will be harmed. O’Reilly’s direction keeps the action moving smoothly and this, the briefest of O’Casey’s trilogy, zips along in 90 minutes, plus an intermission. The cast is very solid, with fine performances from Mellamphy and Hennessy. The role of Donal is regularly performed by James Russell, but it was capably played by Adam Petherbridge when I saw the play. Charlie Corcoran’s scenic design creates the proper mood with lighting by Michael Gottlieb. Ryan Rumery’s original music and sound design by Rumery and M. Florian Staab make the sounds of bombs and gunfire all too familiar. Costumes are by Linda Fisher and David Toser. Sean O’Casey, considered one of Ireland’s finest playwrights, was born in the Dublin slums and was involved in the Irish Nationalist cause for years. His Dublin trilogy, now being staged as the O’Casey Cycle, focuses on the Irish Civil War and its impact on the Irish people. The Shadow of a Gunman will be followed by June and the Paycock, opening March 9 (watch for my review), and The Plough and the Stars, set at the time of the Easter Rising in 1916, on April 20. The O’Casey Cycle also includes free readings, lectures and film screenings. More info here.